Allah, the Ever-LIVING, is He to Whom eternal life is designated; His Life is inaccessible to perdition, death, defects or non-existence. To the Ever-LIVING, absolute existence is attributed; His Life had not been preceded and will never be followed by non-existence He accomplishes all what He plans. In life, the degree of sublimity and superiority is gauged according to perception and acts; hence the life of an animal is superior to that of a plant; the life of a human being is superior to that of an animal as acts and perception place man in a more elevated position. The believer is superior to the sinner who is superior to the pagan. Allah, the Ever-LIVING calls the believer: living, and by analogy, calls the pagan: dead. Allah, Praise and Glory be to Him, says, “Nor are alike those that are living and those that are dead” (FATIR, 22). As the grades of life vary according to the level of perception and acts, the Ever-LIVING is He, under Whose Awareness all perceptible things are included and to Whose Sovereignty all creatures submit; nothing can escape His Knowledge; no achievement can be fulfilled save by HisOwn Will. He created perception, mentalities, hearts, judgment, discretionand assessment; He created life itself, and existence in life is derivedfrom His Supreme Existence. Truly, Allah is the Ever-LIVING; He,Praise and Glory be to Him, says, “He is the Living One, there isno god but He; call upon Him, giving Him sincere devotion. Praise be toGod, Lord of the worlds” (GHAFIR, 65). 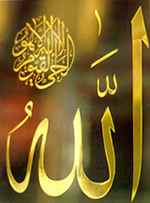 Glorybe to Allah, the Ever-LIVING, He is Allah. «(61) The LIFE-GIVER (AL-MUHYI) (62) The DEATH-INF..